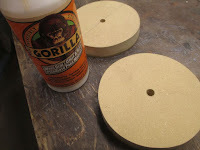 How I made a wooden drive wheel my Dirt Cheap 2 x 72" Belt Grinder project. 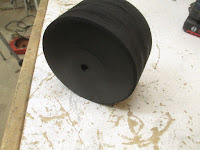 I am going to manufacture a simple wheel for my 3/4 horsepower 2 pole (3600 RPM) ODP pump motor. Unlike the typical 5/8" keyed shaft, this motor has a 1/2" NF (National Fine thread) shaft where the pump impeller was screwed on. 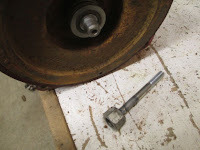 A bolt welded on to a 1/2" NF nut may work to my advantage here and the right-hand thread tightens the nut with the CCW direction of the motor. I'd like the drive wheel to be 2-1/4" wide and three pieces of 3/4" medium density fiberboard (MDF) will stack up to this. The diameter will be 3.82" and the unloaded belt will run at 3600 surface feet per minute, which is a good speed for a broad range of belts and applications. I set my compass to 2" and drew a center line down some 3/4" MDF. I scribed three circles leaving a little room between the circles to cut them out. 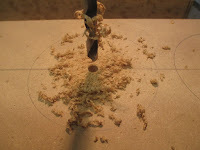 Now I drill a 5/16" hole exactly where the point of the compass marked the wood. 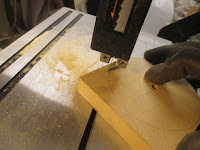 On the bandsaw I slowly cut outside the line. 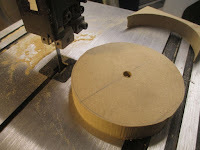 Here is one circle done. Once I had all three cut, I got some good indoor/outdoor wood glue. I put a length of 5/16" threaded rod through the first circle and smeared some glue on and made a stack of the three circles. With a few washers and nuts and tightened the discs together. Expect some glue to ooze out. Now with the clamps I gave the block a squeeze and let sit overnight. 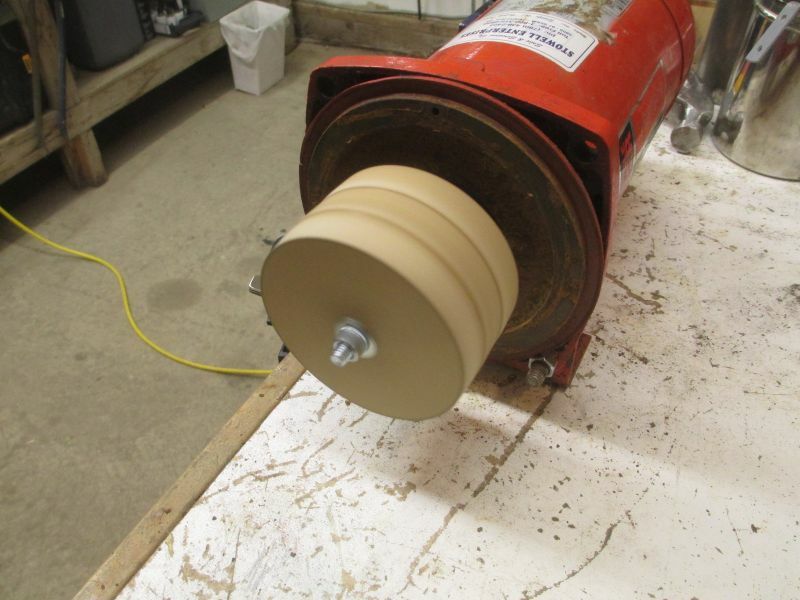 I mounted the wheel on the motor and used a chisel to true the face. Resting the chisel against the edge of the workbench. Some black paint and we're good to go. Here's a video I made that shows the construction of the wheel. OK, so your motor has a different shaft? There are some inexpensive products that can make your life easier. This is tapered bushing. They come in common shaft sizes like 1/2", 5/8" and 3/4" for usually under $10. With this bushing you can fit any just about diameter of wooden wheel you want to make to your motor shaft. 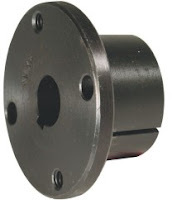 I have another smaller motor with a 1/2" shaft with a flat for a set screw on it. 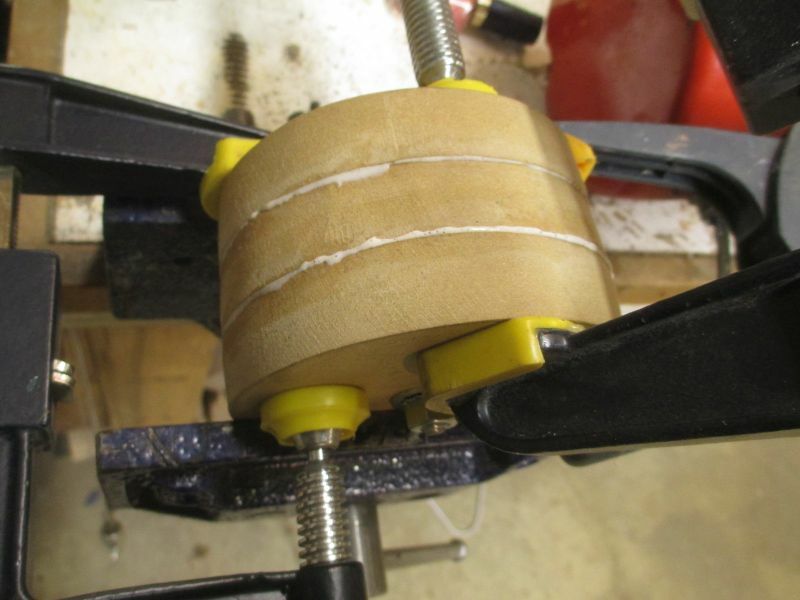 With some 3/4" DOM tube (which has a 1/2" inside diameter) and a 1/2" large flat washer I made a kind of bushing suitable for the little motor's 1/2" horsepower capacity. I cut about 3" of DOM tubing and found a hefty 1/2" washer. 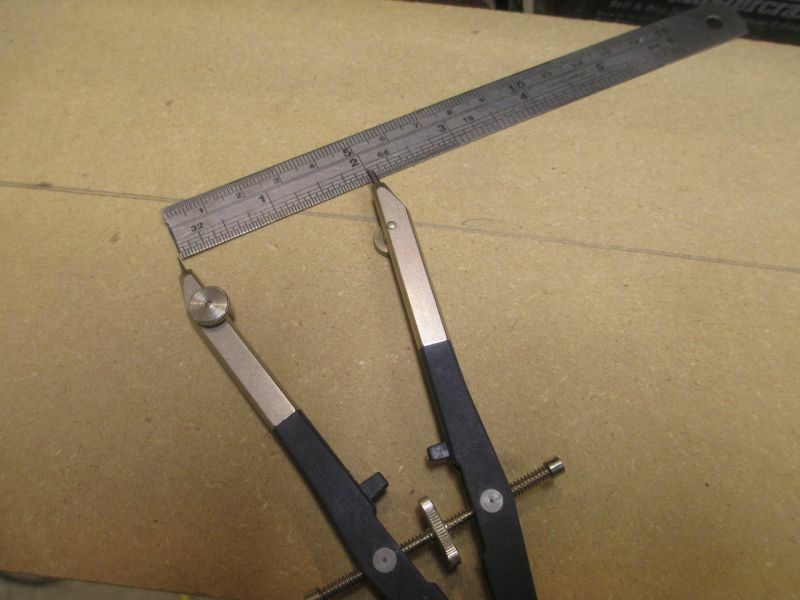 I stacked these on a 1/2" bolt and clamped in the vise. I hit is a few times with the welder. Then cleaned up the welded area with the angle grinder. Now drilled and tapped for the set screw. For this one a 1/4" setscrew is okay. Fine threaded setscrew would be an improvement. 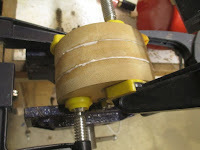 Now I drill two 3/16" holes exactly opposite about 3/8" from the outside of the washer. Countersink the holes for a flathead screw of your choices. 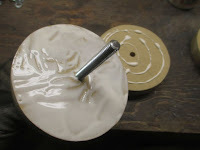 The countersink is option but will give a nice flush look to the finished wheel. Here I have mounted the adapter to the motor shaft and clamped the motor down. While it is running, I take the angle grinder and reduce any wow in the washer. 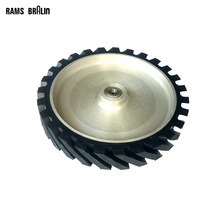 This part can now be fitted to any diameter of drive wheel you want to make. 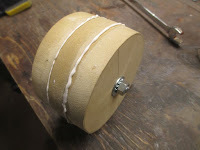 I am working on a 6" wheel for a four pole motor. I'll post some photos when it's done.